Sugar Free Pecan Pralines, are you Even Possible? Last month my husband and I spent a weekend in Savannah, Georgia. One of my favorite things to do there is take a stroll down River Street. I love to shop, what can I say? I admit it, I was bad on my trip. Every shop that sold food was throwing free samples at me. And, hey, who am I to turn down free food? Well, they were handing out fresh pralines. OMG, it was so good. I went through the line. Each of the three times I went through that shop. I told you I was bad! 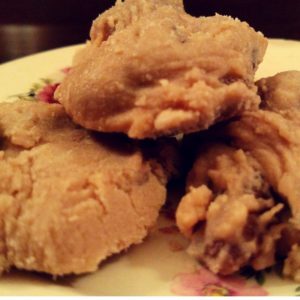 I wondered if I could make homemade low carb sugar free pecan pralines that tasted just as creamy and delicious as the ones I ate in Savannah? Preheat oven to 300 F. Toast the pecans on a cookie sheet until lightly toasted. Mix the first four ingredients together in a heavy saucepan. Bring it to a boil, stirring occasionally. Turn the heat down on low and keep the mixture at a slow boil, stirring constantly. Stir until the mixture because crystallizing on your spoon and the sides of the pan, about 15 minutes. Remove from heat and add the vanilla and pecans. Stir until the mixture cools, about 10 minutes. When the mixture is thick, drop by tablespoonfuls on a cookie sheet lined with parchment paper. Let cool completely. Store in an airtight container. I think the blend of the natural sweeteners is what makes these pralines taste like traditional sugar-laden pralines. Natural sweeteners sometimes have an off flavor, but I found that combination of golden monkfruit and sukrin didn’t. I know a lot of bloggers swear by powdered Swerve, but the off taste and cooling effect is honestly disgusting to me. I refuse to make anything with Swerve. I’ve been using the sukrin melis as a substitute for powdered sugar. Oh my gosh, no cooling and no aftertaste! You might be wondering what’s in sukrin since you’ve probably never heard of it. Sukrin melis is just a erythritol and stevia blend. I’ve been using the golden monkfruit as a substitute for brown sugar for a while now. It tastes just like brown sugar! Golden monkfruit also gives the pralines its signature brown color, too. 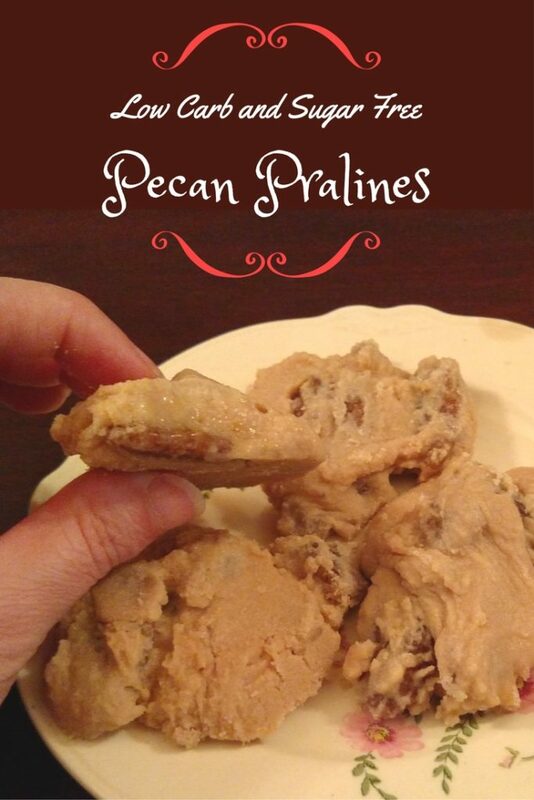 Traditional southern pecan pralines are made using a candy thermometer. I thought I would need one, too, and then I’m like, duh! My sweeteners don’t have the same chemical properties of sugar. I was surprised I got a nice thick creamy consistency by essentially just reducing the mixture. A word of warning, these are REALLY sweet. I can only eat one at a sitting, so if you are worried about overeating and ruining your carb count, I think you’ll be good! BLC (before low carb) I always made some sort of Christmas candy every year. I’ve really missed my homemade candy during the Holidays. This year I plan on making pecan pralines as a low carb Christmas candy. I will feel like I’m splurging, but at around 5 carbs a piece, I’ll still be sticking to my keto diet!